With Christmas right around the corner, the Hudson Valley is packed with festive activities to partake in. From meetings with Santa to rides on the Polar Express it’ll be hard to be bored this holiday season. 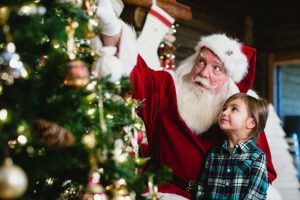 This Christmas season the Bear Mountain Inn in Rockland County is offering the opportunity to have breakfast with Santa Claus himself every weekend in December leading up to Christmas. Priced at $16.95 for children under the age of 12 and free for kids under four years old, it’s a hard experience to overlook. Located in Goshen, only about a 30 minute drive from campus, Watt’s Christmas Wonderland offers the experience of driving through “a dazzling array of lights and displays”. It is open from 6 p.m. to 9 p.m. every night from Dec. 7 to Dec. 30. $5 is the suggested donation upon entry. Adams Fairacre Farms is hosting Mr. Claus at each of their four locations in Poughkeepsie, Newburgh, Kingston, and Wappinger. Times and dates vary with each location, but Santa will be available for photo ops every Saturday and Sunday until Dec. 23 in Newburgh. The well known book and movie is being brought to life by the Catskill Mountain Railroad only a half hour away from the Mount in Kingston. Each passenger will be able to have their own golden ticket punched and receive their very own silver bell at the end of the ride. The ride itself is filled with hot chocolate and other treats as well as singing and dancing. Off-peak prices for this experience is $40 for adults and $32 for children. Toddlers under the age of two can ride for free.